The Alliance For Democracy - News, eNewsletters, Alerts and Chapter News: On the march for independence from corporate rule! On the march for independence from corporate rule! AfD member and clean election activist Carole Luteness was one of several AfD'ers who took to the streets on Independence Day to raise awareness of corporate personhood, corporate rule, and the need to get big money out of politics. 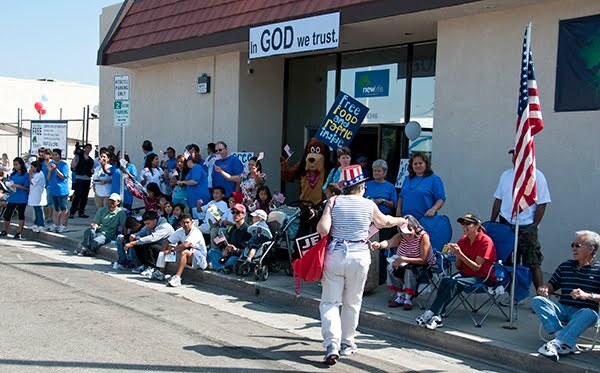 Carole writes, "Our Santa Clarita Fair Elections committee joined forces with our local Democrats to march in the Santa Clarita 4th of July parade...About 500 AfD bookmarks calling for the end of Corporate Personhood were handed out. Santa Clarita is a VERY conservative community but you would be surprised how many people were very responsive to our message, "abolish Corporate Personhood, restore Democracy to the people. Big Corporations have captured both parties" as the fliers were distributed. "We are taking two Resolutions to the CA Dem Party E-Bd in July calling for a 1.A Constitutional amendment identifying constitutional rights are reserved only to human persons (which was passed recently by the Los Angeles County Democratic Party), and 2. A resolution calling for rescinding BP’s Corporate Charter and seizing its assets because of repeated felonious behavior. I will keep you posted about our efforts." Connecting with the crowd along the parade route. Democracy and clean elections people joined forces with local Democratic party supporters to decorate a car for the parade.